Multiple film formats (120/220, 35mm, etc.). 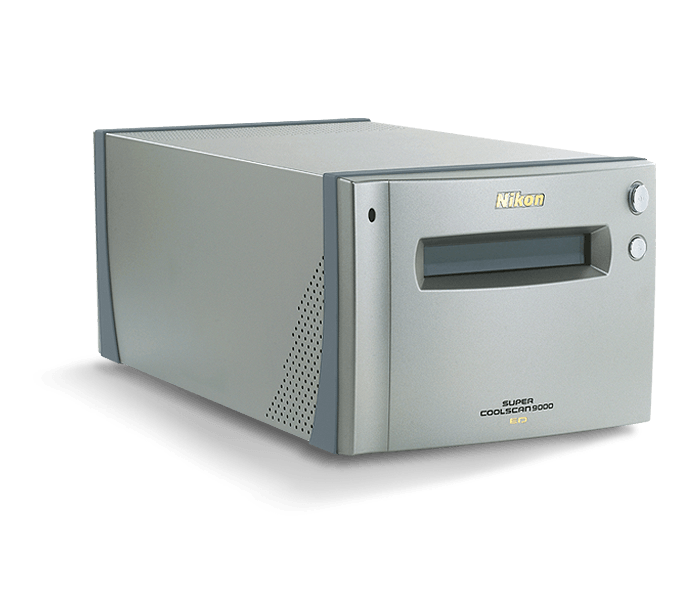 Large diameter scanner Nikkor Extra-low Dispersion (ED) glass lens. Improved rod dispersion LED illumination technology. High-speed scanning (35mm slide film - 40 seconds, 6 x 9 - 185 seconds). Newly-developed, high-quality 3-line CCD sensor. New, advanced image processing algorithm for colour negative film. Digital ICE4 Advanced (Digital ICE Quad Advanced) with Digital ICE Professional - more compatible with Kodachrome film. Media: Negative and positives, in colour and monochrome. 35mm film: 1-2 strips of 1-6 frames; up to 3 frames of 24 x 48mm or 24 x 65mm panorama film can be scanned with optional 120/220 film rotating holder with glass FH-869GR. 35mm slides: 1-5 slides with mounts, 1.0-3.2mm thick, 49-50.8mm wide. Medium-format film: 1-4 frames (6 x 4.5), 1-3 frames (6 x 6), 1-2 frames (6 x 7, 6 x 8 or 6 x 9). Medium-format slides: Slides with mounts 1.0-3.2mm thick can be scanned with optional 120/220 mounted film holder FH-869M. 16mm film: 1-3 strips of 1-20 frames can be scanned with optional 16mm film holder FH-816. Glass slides for microscopes: 1-3 prepared slides (26 x 76mm, 0.8-2mm thick) can be scanned with optional medical slide holder FH-8G1. FH-835S: 25.4 x 37.5mm/4,000 x 5,904 pixels. FH-835M: 37.5 x 25.6mm/5,905 x 4,032 pixels. FH-869S, FH-869G: 6 x 4.5: 56.9 x 42.5mm/8,964 x 6,696 pixels, 6 x 6: 56.9 x 56.9mm/8,964 x 8,964 pixels, 6 x 7: 56.9 x 70.0mm/8,964 x 11,016 pixels, 6 x 8: 56.9 x 77.5mm/8,964 x 12,204 pixels, 6 x 9: 56.9 x 83.7mm/8,964 x 13,176 pixels. FH-816: 15.0 x 21.48mm/2,362 x 3,384 pixels. FH-8G1: 46.02 x 24.0mm/7,248 x 3,780 pixels. Scanning system: Fixed optical, movable media, parallel single-pass scanning system. Light source: R, G, B and Infrared (IR) LEDs; light source with rod disperser and light output slot. Image sensor: 10,000-pixel, three-line monochrome linear CCD image sensor. Colour separation: Performed by RGB LEDs. A/D conversion: 16 bits per colour. Output: Full colour or gray scale at 8 or 16 bits per channel. Power requirements: AC 100-240V, 50/60Hz. Operating environment: Temperature 50-95°F (10-35°C), relative humidity 20-60%. Dimensions: 9.8 x 19.6 x 8.0 in. (W x H x D). CPU: Pentium® 300 MHz or faster. Hard disk: 40MB required for installation (200MB is recommended), with an additional 200MB of free disk space available while Nikon Scan is running. Display: 800 x 600 with 16-bit colours (full colour is recommended). Interface: IEEE1394: OHCI-compliant, IEEE1394 interface required. Others: CD-ROM drive required for installation. CPU: Power PC G3 or later (G4 or later is recommended). Hard disk: 70MB required for installation (200MB is recommended), with an additional 200MB (Mac®OS 9) or 550MB (Mac®OS X) of free disk space while Nikon Scan is running. Display: 800 x 600 with 16-bit colour (full colour is recommended). Interface: IEEE1394: Only built-in IEEE1394 ports supported. * Note: More memory may be required depending on film type, scan size, resolution, bit depth, the number of scans performed in each session, the film holder or adapter used, and whether Digital ROC or Digital GEM are used. A system with more than the minimum amount of memory is recommended.